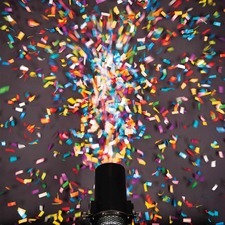 Easy to use professional confetti canon! Launches up to 1/2 pound of confetti at the press of a button. No C02 makes this very safe to use. The launch duration is 25 seconds and it has a throw distance of 30 feet which will give you a coverage area of approximately 540 feet. Super fun effect for parties! The rental of the Confetti Canon includes 1 pound of multi-colored confetti which is enough for 2 full launches (at 1/2 pound max per launch). You can use less confetti for each launch if you want to have more frequent launches, with just less confetti.